Preheat oven to 350 degrees. Heat jam, corn starch and water together in small saucepan. Cook until jam thickens, set aside. Roll out sheet of Pepperidge Farm® Puff Pastry on lightly floured surface. Slice Pepperidge Farm® Puff Pastry into 36 equal sized rectangles. Spoon small amount of jam mixture onto 12 rectangles. Layer with 12 more rectangles. Spoon small amount of peanut butter on top. 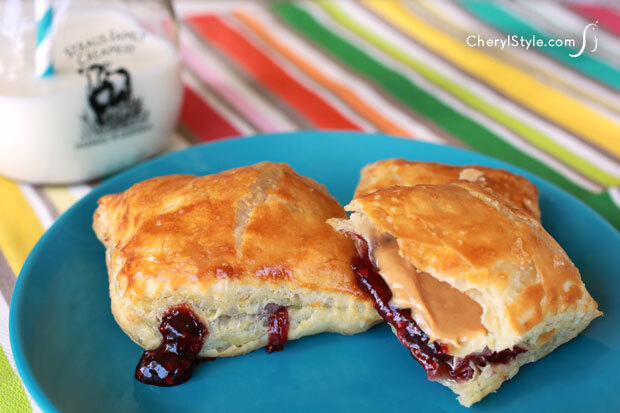 Layer with 12 more rectangles (so the puffs have a layer of pastry, jam, pastry, peanut butter then pastry). Press edges of Pepperidge Farm® Puff Pastry to seal fillings. Seal edges of pastry with pastry wheel (optional) or crimp with a fork. Brush sandwich puffs with egg wash. Bake 12-15 minutes, or until sandwich puffs are golden brown.